We have been happily distracted from the Locost project this past week with family in town, but we still managed to knock out a few more tasks in anticipation of completing our rolling chassis sometime this year. We finished all of the welding on the rear axle, based on our definition of finished, then rebuilt the front hubs and installed most of the front suspension. It was during this last task that we discovered something interesting about metalastik suspension bushings. Ever since we pressed in our first suspension bushing, more than six months ago now, we've been trying to come up with a good way to bolt the bushings into the suspension brackets. 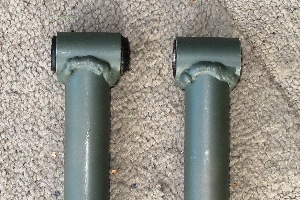 The problem was always the same—the bushings are so tightly packed into the bushing tubes that the ends of the bushings squeeze out of the ends of the tubes. 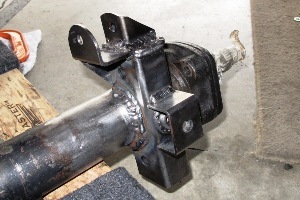 Bolting a 1-7/16" bushing tube into a 1-3/4" bracket, using flat washers to fill the gaps, clamps the ends of the rubber bushing so tightly that suspension movement is severely curtailed. We looked at lots of different solutions, like using smaller washers, or cone washers, or spacer tubes. We found a few things that looked promising, but in the end, no matter what we tried, installation was impossible. The bushings, together with the washers, would not fit into a bracket unless they were already completely squeezed together, and we just couldn't figure out a way to do that. We tried fitting in everything except one washer, but then we couldn't slide in that last washer afterwards because of the rubber squeezing out the end of the tube. So it's been a nagging problem for a long time, and it's times like these that we realize that we're not as clever as we think we are, and that we are only pretend engineers. Real engineers would've looked at the problem six months ago and said, simple. Just chop off the excess rubber. Really? we'd have said. You can do that? And the suspension won't fall apart? Apparently not. So we dug out an X-acto blade and trimmed the excess on all twelve bushings with very few injuries, and just like that all of our installation problems disappeared. Our next task was a little easier, allowing us to regain a small measure of self-esteem and restore our faith in our ability to complete this project. 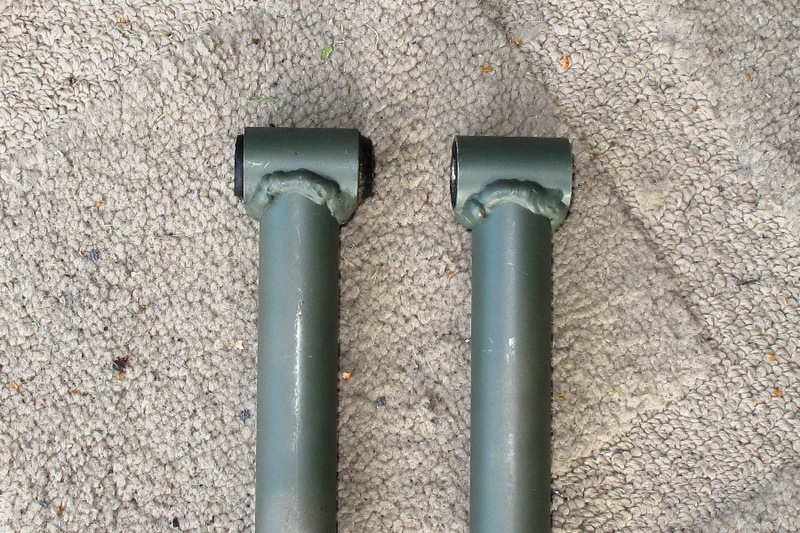 We welded the rear shock mounts onto our trailing link brackets, using the exact dimensions and specifications in the book, or if not exact then close enough, and it looks like they're actually going to work. With the shock mounts in place we were all set to install the rear axle in the chassis, but then someone thought it would be a good idea to paint the bare steel axle and brackets with primer, and so now we have to wait for the primer to dry. In the meantime we rebuilt the front hubs. This turned out to be pretty simple once we found a YouTube video showing how all the various parts go together, and in what order. It turns out that the most critical parts are shims, which allow you to torque the hub nuts to 60 foot-pounds while providing enough end float so the bearings can still turn. Because these shims are so critical, we of course did not have enough of them. You're supposed to have one .030" shim per side, and a collection of .010, .005, and .003 shims that let you adjust the end float down to .002-.003". It turns out we had one .030 shim, and one .010. For both sides. We're not sure why. We refuse to believe that any shims were lost during disassembly of the donor, but that's certainly an option for you. Luckily these shims can be purchased, although not cheaply and not at the local hardware store. So we'll have wait for another package to arrive next week, and in the meantime we assembled the hubs with the nuts held on by cotter pins instead of torque. Since we're not planning to actually drive the car anywhere in the next several days, we should be okay. 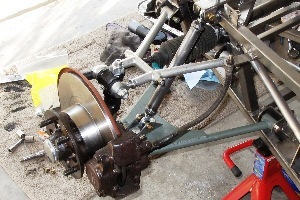 Sooner or later we're going to have to extend the steering tie rods. The Locost track is nearly 3" wider than the track on an MGB, so the tie rods need to be 1-1/2" longer. Clearly some kind of welding will be involved, but how and by whom is yet to be determined. 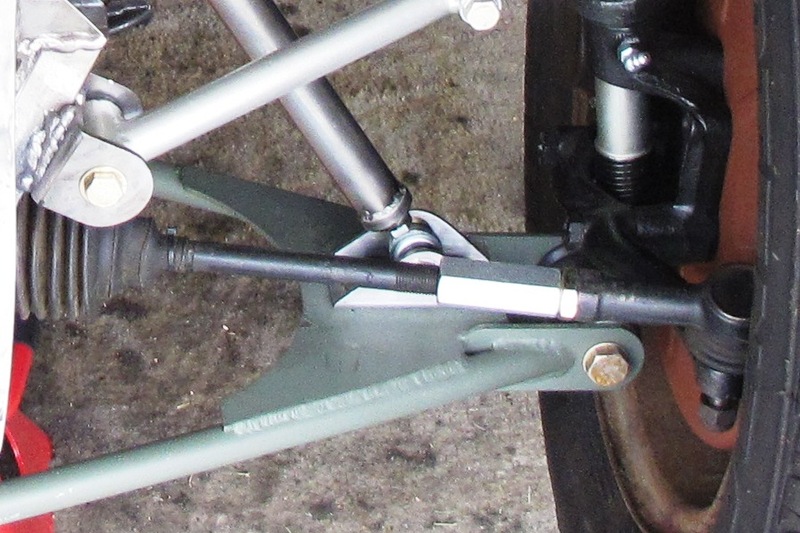 In the meantime we needed to fix the massive toe-in with our current configuration, so we added a 3" length of threaded rod to the left tie rod and connected it with a cheap coupler nut. The front wheels are now parallel, more or less, and we won't worry for the moment that the steering wheel won't turn very far to the right. We're now down to our last five tasks before we can roll our Locost out into the street. 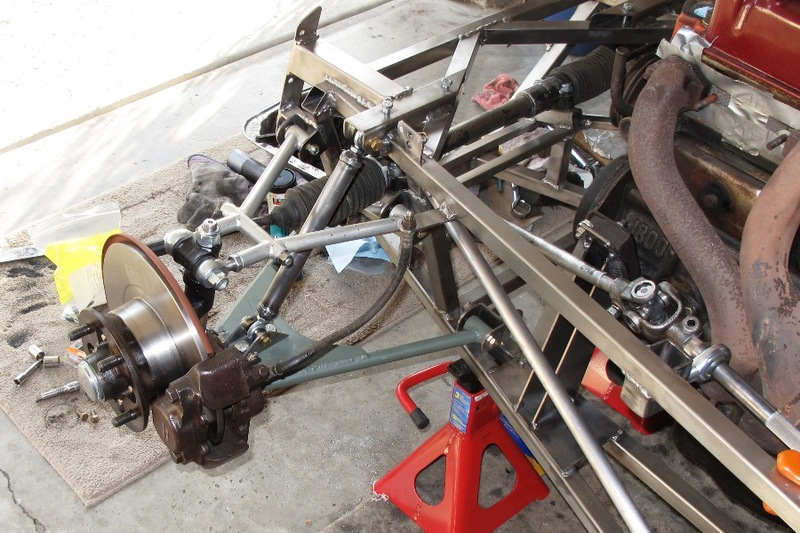 These tasks include 1) rebuilding the rear suspension, 2) attaching the rear hubs, 3) installing the steering assembly, and 4) installing the pedal assembly. Step 5 is bolting on wheels and lowering the car to the ground, a task we don't anticipate many problems with, and in fact none of these tasks should prove to be terribly difficult, however there are a lot more pieces on the car now, some of which are pretty big, like the engine and transmission, so bolts, wrenches, and car parts may not fit as easily as they did before. We'll know soon enough.